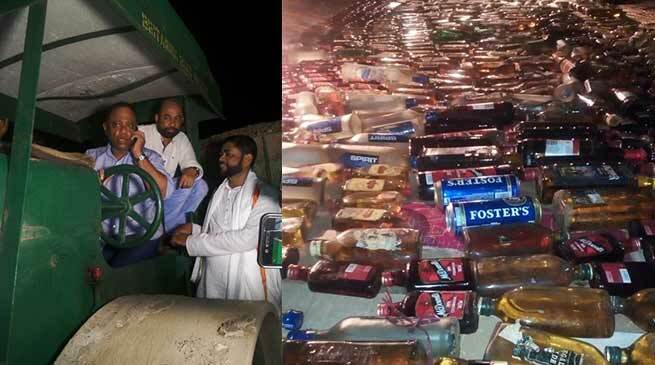 Minister for Excise, Parimal Suklabaidya crushed over 1,500 bottles of seized Indian Made Foreign Liquor (IMFL) at an estimated value of around Rs.2 lakh near Bus Terminus in Hailakandi town here on Tuesday. Leading the battle against liquor cartel from the front, Minister Suklabaidya warned that the law violators would be dealt with severely. The illegal liquor bottles were seized by the Excise personnel from different parts of the district. On August 10, Minister Suklabaidya drove a road-roller to destroy more than six lakh liquor bottles and cans worth over Rs.168.54 crore at Gorchuk area on the outskirts of Guwahati, that were seized from 14 Guwahati-bound trucks in the hill district of Karbi Anglong in December 2016.